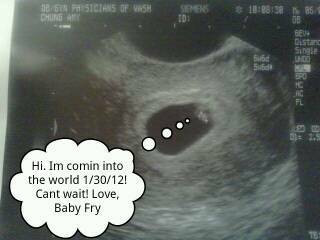 Our first appointment with my gynecologist was at the six week mark. I had already gone in for a Beta the week before, so we knew we were pregnant and the Dr. mentioned coming in the next week. Since my gynecologist no longer does obstetrics, he mentioned I would probably need to see one of his colleagues but that for the first appointment, I could see him. Little did I know, our first REAL appointment usually doesn't take place til week 10. So I dragged the Husband along with me for what I hoped was not a waste of time, but was worried when the nurse said "well I don't know what Dr. X can do for ya, but let's wait here for him". Needless to say, our first appointment was a great success. I love my Dr but was sad that he no longer delivered babies, so I made an appointment with another Dr in the same practice. On our way back to work, My Husband looked over at me and said "I'm so happy!" which of course made me thrilled... We are blessed!